It is ironic that sixty seven years after independence we have still not been able to get our fundamentals right. Classic example is the controversy over singing the national anthem in Tamil. We are unnecessarily preoccupied with emotive issues of language and religion and too little time is devoted to the vital matter of achieving economic and social wellbeing of the people. Chauvinistic elements backed by some politicians seem to think that singing the national anthem in Tamil is the greatest crime ever to be committed on the Sri Lankan soil. It is strange that they are silent about fast spreading evils such as use of drugs, alcoholism, bribery and corruption which are detrimental to the progress of the entire nation. National anthems are usually written in the most common language of the state. However states with multiple national languages may offer several versions of their anthem. For instance, Switzerland's national anthem has different lyrics for each of the country's four official languages: French, German, Italian, and Romansh. The New Zealand national anthem is traditionally sung with the first verse in Māori ("Aotearoa") and the second in English ("God Defend New Zealand"). The tune is the same but the lyrics have different meanings. South Africa's national anthem is unique in that five of the eleven official languages are used in the same anthem, in which each language comprises a stanza. The lyrics employ the five most widely spoken of South Africa's eleven official languages – Xhosa (first stanza, first two lines), Zulu (first stanza, last two lines), Sesotho (second stanza), Afrikaans (third stanza), and English (final stanza). The United Kingdom's national anthem is God Save the Queen but its constituent countries also have their own anthems which have varying degrees of official recognition. England, Scotland, Wales and Northern Ireland each have a number of anthems which are played at occasions such as sports matches and official events. That is how some of the multi ethnic countries have resolved their issues and there is hardly any language issue in these countries. The fear of ‘each other’s language’ is a stumbling block in our march towards prosperity as one nation. 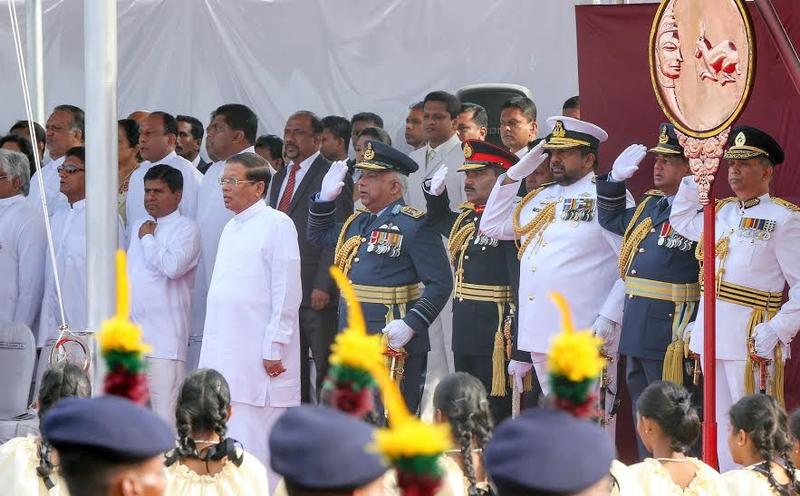 The solution is to learn how to respect each other’s language and in that sense the bold decision of President Maithripala Sirisena and Prime Minister Ranil Wickremesinghe to close the sixty eighth Independence Day celebrations with the national anthem being sung in Tamil is indeed a giant step towards national reconciliation.